Crest Animation, an Indian full-service studio that specializes in the development and production of digital animated properties has launched a game (available free of cost) called 'Jewel Seeker' on the Apple app store. The game will function on apple devices like the iPhone, iPod Touch and iPad (requires iOS 3.0 or later). 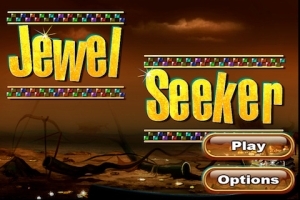 Jewel Seeker has been developed by the in-house team of programmers and CG Artists at Crest and is a game based on the basic fundamentals of physics. Crest's earlier works include 'Alpha & Omega', a 3D animation stereoscopic film and this is the first time the studio has ventured into mobile game development. Ever since the game's launch, it has jumped up from the 350th position to the 71st among Indian games on App store according to indiantelevision.co.in. The game is basically a ball and trajectory game, where players have to hit the jewels with balls. There are 60 levels in total and you have to get maximum number of crystals with the minimum number of balls to achieve a high score. I tried the HTML5 version of the game (available for web users on GameSalad.com) on my laptop and must say it was nothing to write home about. The ball sling got stuck most of the time and the power adjustment was not that accurate. Additionally, the low shot-failure limit increased the difficulty of the game a lot. Crest Animation CEO AK Madhavan said, "Crest plans to release casual games on a quarterly basis. We are already on the completion of a couple of other games. We will soon be able to release a sneak preview of these games." Headquartered in Mumbai, Crest Animation, together with its LA office, has delivered more than 200 half hours of television and home video titles in CGI animation, working for such clients as Mike Young Productions, Mark Brown, Classic Media, Nelvana, American Greetings, Marathon and Nickelodeon. Also, the film Alpha & Omega has been accepted for consideration in the animated feature film category for the 83rd Oscar Academy Awards.